Welcome to Colorado. 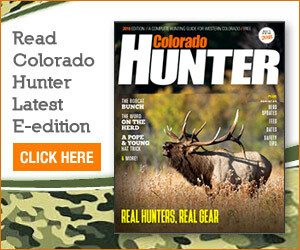 We sincerely appreciate that you chose Colorado as your hunting destination. Keep in mind that Colorado Parks and Wildlife is always available to answer your questions and help you have a great hunt this year. Our state remains one of the premier hunting destinations in the country, and the Northwest Region once again offer tremendous opportunities for big game hunters this fall. In this letter is a general overview that can help you plan; however, you must be prepared to adapt your strategies to sudden and drastic changes in weather conditions, road closures and other events that may affect your hunt. Remember, a hunt does not always end with a harvest. Spending time with friends and family in one of the most scenic areas of the country is a reward in and of itself; however, by doing your homework and adapting your strategies as needed, you can significantly increase your chances. There is a significant amount of public land in northwest Colorado, allowing sportsmen plenty of hunting opportunities. With a good set of maps such as those at www.bit.ly/cohuntingatlas, www.huntdata.com or www.coloradohuntingmaps.com, or by using a GPS unit or even Google Earth, sportsmen can find a variety of hunting areas that will fit their needs. Remember that it is the sportsman’s responsibility to know private land boundaries. Never trespass onto private land. We urge all sportsmen to hunt carefully and legally. This not only helps you remain safe, it protects the species you’re hunting and demonstrates to the public that hunters are ethical and law-abiding. Remember, you are the best ambassador for the sport. During the rifle seasons, all hunters are required to wear 500 square inches of visible fluorescent orange garments (including any head covering), visible from 360 degrees. Placing a camouflage backpack over an orange vest or coat can minimize the visible orange and thus reduces your visibility. Visibility equals safety in the woods. Being 100 percent sure of your target before you shoot is critical and can help you avoid serious accidents such as shooting the wrong animal, or worse. Always know the laws associated with hunting, including Hunter Education requirements, tagging procedures for a harvested animal and the proper methods of take. A variety of regulation brochures can be found at www.bit.ly/yourbrochurescpw. Unfortunately, not everyone chooses to be responsible and ethical. If you see a wildlife violation occur, please call Operation Game Thief — a tip line for wildlife violations at 1-877-265-6648. You can find harvest stats, population objectives and general information in our NW Region Hunt Guide. Pick one up at a local CPW office, or download a PDF copy from our website at www.bit.ly/cpwhuntguides. In recent months, the region has received good moisture, leading to better than average forage conditions. Hunters should see healthy big game animals this fall. Elk populations remain healthy and stable and hunters have a good chance to see a good-sized bull. Population objectives have been met and although license numbers are less robust than in previous years, some units have seen an increase in licenses to insure they remain at objective. Keep in mind that Colorado remains the only state that offers an unlimited number of over-the-counter bull elk licenses during second and third rifle seasons, in addition to leftover licenses. Antelope herds are also doing well and hunters who have drawn a license should find plenty of opportunities and be successful. Northwest Colorado has some of the highest antelope numbers on the West Slope. Our bear populations have been growing and there are more license opportunities now than ever before. Just keep in mind that hunting bear takes plenty of patience and some luck. Doing your homework should increase your chance of success. Keep in mind that a professional and friendly District Wildlife Manager manages every GMU. They are the experts and a great source of information. Feel free to ask them questions about the area you are hunting, regulations or anything else that can help make your hunt more enjoyable. To find the office nearest you, visit www.bit.ly/contactcpw. Finally, remember to have fun during your hunt. Enjoying the outdoors can be a great experience for an individual or a group and spending time with friends and family can provide memories that will last a lifetime. Northwest Colorado provides some of the most spectacular views and scenery anywhere in the country and we wish you luck and hope you have a great hunt this year.